1 X 'Product Name' has been added to your basket. Armagnac, Cognac, Brandy; whats the difference? Like Garlic? Then this lovely garlic shaped roaster is for you. 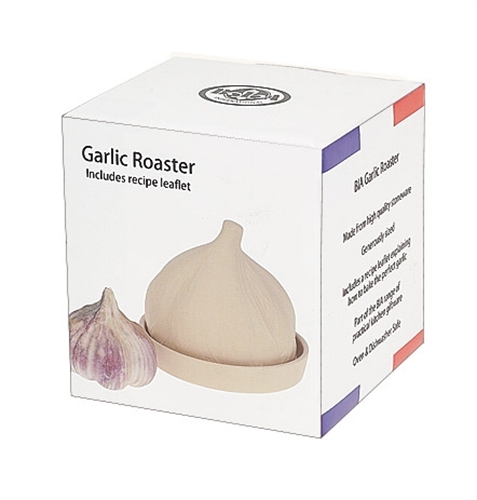 Perfect for soft succulent garlic, which is ideal for spreading on our crusty breads! Includes brief recipe leaflet, and looks lovely when not in use! what is a word cloud? We want you to be completely satisfied with our goods. However, despite our best efforts, things do go wrong, parcels do go astray, or perhaps its not the right colour. Regardless, we want to make sure we put them right as quickly as possible. So to return goods, we need to give you a Return Merchandise Authorisation (RMA); please dont send anything back without contacting us, and obtaining an RMA. under Orders, select the Previous Orders tab. Refunds ... The Cheese and Wine Shop of Wellington offers a full refund on all goods that you may be dissatisfied with (this includes Sale items). Customers who send back unwanted goods that are not damaged will receive the value of the item purchased less the delivery costs. We will consider the overall condition of the product being returned when making a refund. As soon as we receive your goods we will process your request for a replacement item or refund. We will notify you via email as soon as your request has been processed. You will need to pay the cost of returning goods to us, unless the goods are defective in which case you will receive a full refund including your postage and packaging costs. Proof of return and postage will be required should an item be lost in transit. Neither refunds nor replacements can be made until such proof is provided. We strongly suggest you get a Certificate of Posting from the Post Office when you send an item back. If you have requested replacements of a higher value, you will need to contact us to make the additional payment. Once you have a return number from us, and you need to return the goods ... please enclose your order number and ensure all items are well packaged to prevent damage. We recommend using a tracked service to ensure they reach us. Once the goods are received, we will issue the appropriate replacement or refund as detailed above; please allow upto 21 working days for this process.